So, you have chosen the roulette casino game to try and win something, but what's the roulette rules? 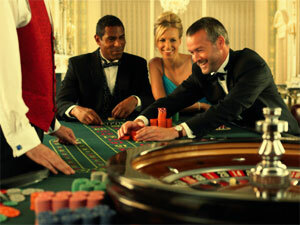 It is a really good choice: roulette is the most popular game which is the symbol of every casino. As far as we know from the roulette history, this game had appeared in France and became popular and loved very quickly. What should you know in order to play roulette successfully? 1. Roulette is the game of chance, so forget about all winning strategies which are proposed. 2. Types of roulette bets and their payouts are probably the most important thing to know well. 3. Do not forget about a wheel and table layout to understand everything clearly. 4. Remember the object of the game and its simple rules to play. Famous roulette players are a great example of the fact that roulette casino game is quite possible to win. In roulette you play against of a casino: 8 players maximum can sit at the table and one dealer (a croupier) controls the game. His/her work is to control bets and payouts and spin the roulette wheel with a ball. Your goal is to guess what number of roulette wheel the ball will stop at: you make your bets on any number or a group of numbers which will be a winner to your mind. How to play roulette step by step? 1. Buy special roulette chips to make your bets. 3. Place chips on the surface of roulette table, on a number you want to bet on. 4. A croupier spins a wheel and draws a ball; after s/he announces "No more bets! ", you do not have a right to change your bets or touch chips. Do not do that also when a dolly is on the table already. 5. If you have won and you want to take your winnings, exchange roulette chips for regular casino chips: you will be able to exchange them for real money afterwards. NB! Remember about house edge and roulette payouts you can get for every type of bet you make! House edge: 2,67% - European Roulette, 5,26% - American Roulette. En Prison: when a zero sector wins you have a choice to take a half of your bet back. You can refuse and leave the same bet for the next round: in a case of 0 winning you will lose the whole bet. La Partage: this rule is the same with En Prison rule but it is about outside bets only: you are welcome to take a half of your bet back or leave it for the next round when a zero sector wins.